This video, showing a recent discussion hosted by the Hudson Institute between Lee Smith and Israeli diplomat George Deek is titled “What Does the Latest Wave of Violence in Israel Portend?” but goes way beyond that subject matter and is well worth the 90 minutes of viewing time for anyone who wants to see beyond the narratives promoted in BBC coverage of the current wave of terrorism. Whilst the BBC practice of avoiding reporting on the topic of Palestinian incitement and glorification of terrorism has been particularly obvious during its recent coverage of the current wave of terrorism in Israel, that policy is of course by no means new and we have even seen BBC journalists trying to whitewash the issue. Palestinian Media Watch – one of the foremost researchers of that field – recently produced a new report on the topic which was presented to the Knesset’s Education committee. Readers can find PMW’s report here. Another subject meticulously avoided by the BBC is that of Palestinian and/or Israeli Arab voices which do not conform to the corporation’s narrative-driven, monochrome portrayal of ‘the conflict’. ‘Mida’ brings us one such voice: that of Nael Zoabi – principal of the Tamra Ha’emek elementary school and an activist for Jewish-Arab coexistence. Over at the Times of Israel, Haviv Rettig-Gur has a thought-provoking article titled “Losing Palestine”. “The Palestinian national movement once had a coherent narrative. The Israeli polity, it claimed, was a political construct resting on force of arms and doomed to collapse under the weight of its own injustice, taking with it back to the colonialist, imperialist West the millions of Jews it dragged into this land. This narrative formed the underlying logic of Palestinian terrorism. Brutality was lionized precisely because in this analysis of the Israeli enemy, exacting a high cost for Israel’s continued existence hastened the day of its collapse, of its succumbing to its inherent weaknesses. 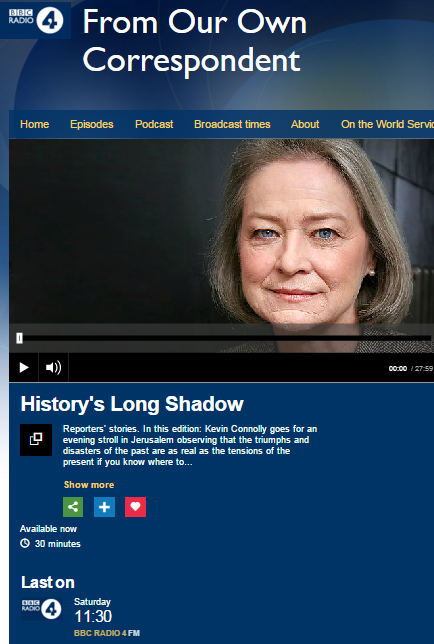 As noted in a previous post, the October 18th edition of BBC Radio 4’s ‘The World This Weekend’ included an item by Kevin Connolly (available for a limited period of time from 25:41 here). 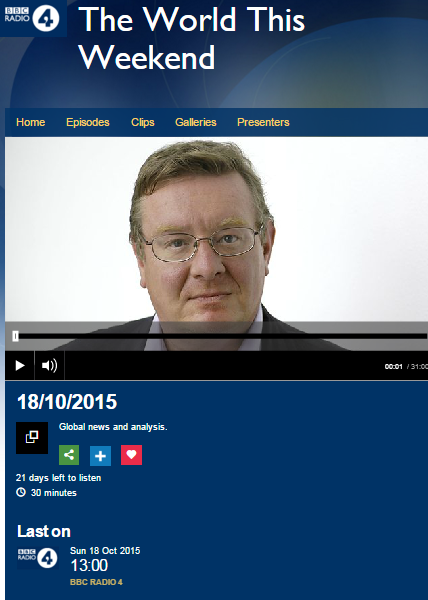 In addition to Connolly’s amplification of baseless conspiracy theories pertaining to Temple Mount and promotion of the notion that the “identity” of Temple Mount is “Islamic”, a number of additional themes seen repeatedly in BBC coverage of the current wave of terrorism in Israel were promoted by Connolly and the programme’s presenter, Edward Stourton. Stourton’s introduction began with promotion of equivalence between Israelis murdered by terrorists and the perpetrators of those attacks – who clearly interest him more than their victims. The inaccurate notion that the current violence is “new” has also been seen in previous BBC content but of course there is nothing “new” at all about knife attacks or – as the second Intifada showed – about Palestinians committing terror attacks in which the likelihood of their being killed in the process was either obvious or intended. Kevin Connolly opened his report in his typical flowery style. In fact at least four perpetrators of attacks which took place before Connolly’s report was aired came from Jabel Mukaber – including the two who carried out an attack on a city bus in East Talpiot which has now claimed three fatalities and the one later described by Connolly in this report as “a motorist” – not, of course, a terrorist – who murdered a Rabbi waiting for a bus. He next promoted a theme which has been dominant in his own previous reports and in other BBC coverage: the description of attacks directed at Jews (rather than “Israelis” as Connolly suggests) as ‘random’ events. Concurrently, Connolly ignored the known affiliations of some of the attackers with terrorist organisations and, predictably, refrained from telling listeners about the connecting thread between all those ‘random’ attacks: incitement. But just in case listeners were by now drifting off message, Connolly brought them back with more promotion of equal suffering and inaccurate portrayal of violent riots as “protests”. Of course the vast majority of Palestinians in “the West Bank” have actually lived under the control of the Palestinian Authority for the past two decades, meaning that Connolly’s attempt to persuade listeners that Israel controls “every detail of daily life” in places such as Ramallah, Nablus or Jenin is decidedly embarrassing. This report from Connolly contributed nothing new to audience understanding of the wave of terrorism in Israel because it followed the now well-established template of BBC coverage according to which attacks not named as terrorism are portrayed as ‘random’ or ‘spontaneous’ and attributed to ‘fear’ and ‘anger’ created by “the occupation”. After almost four weeks of BBC coverage of the current wave of terror attacks in Israel, the promoted themes – and the deliberate omissions – which reflect the corporation’s editorial approach to the story have become clear and we will be addressing that topic fully in a future post. Nawal Assad also promoted the Palestinian narrative according to which all of Temple Mount is “the al Aqsa Mosque”. On October 9th viewers of a filmed report broadcast on BBC television news programmes heard Orla Guerin also promoting the inaccurate notion that all of Temple Mount is “the al Aqsa Mosque” when she told them that “It’s [the Old City of Jerusalem] home to the Al Aqsa Mosque; sacred to Muslims and Jews“. On October 13th an interviewee in a report by Yolande Knell told viewers of BBC television news programmes that al Aqsa Mosque had been ‘invaded’ and ‘disrespected’ and that Israel is “fighting our religion” – Islam. Not only did Yolande Knell fail to relieve viewers of the misleading impressions created by those inaccurate claims, she went on to amplify them yet again in an audio report broadcast two days later on BBC Radio 4. On October 16th the BBC’s Middle East editor Jeremy Bowen also told viewers of a filmed report shown on BBC television news programmes that Temple Mount is “the Aqsa Mosque”. On October 24th in an audio report aired on BBC Radio 4 Kevin Connolly likewise promoted the notion that Temple Mount is “al Aqsa compound” – and that the entire site is solely “Islamic”. Had BBC audiences received comprehensive information over the past four weeks on the topic of the incitement concerning Temple Mount which has been put out by Palestinian Authority sources and officials of the highest level (among others), they might have been able to understand what causes those “deaf ears”. Likewise, had they been informed of the religious motifs evident in much of that incitement, they would have been better placed to join the dots between the whipping up of anger to a point at which young Palestinians murder Jews on the street in Jerusalem and the murders of cartoonists and Jews in a shop in Paris or a British soldier on a London street. But of course the topic of the incitement fueling this wave of terror – and in particular that disseminated by the ‘moderate’ Palestinian Authority and its ‘secular’ president – has been studiously avoided by the BBC over the last few weeks, except when alluded to briefly using the standard ‘Israel says’ formula. The reason for that is that the religious aspect of this story is one which does not comfortably fit into the BBC’s wider narrative and so it has been consistently sidelined in favour of ‘contextualisation’ featuring ‘occupation’, ‘humiliation’ and ‘failure of the peace process’. However, as can be seen in the examples above, the BBC apparently has no problem accepting – and amplifying – the falsehood that Temple Mount (significant to all three Abrahamic religions) is “the al Aqsa Mosque” and exclusively “Islamic” or “Muslim”. The aim of that narrative is of course to deny Jewish history and negate Jewish links to Jerusalem. Who would have thought that we would have reached a point where the self-styled “standard-setter for international journalism” has embraced the role of amplifier of a false narrative rooted in religious and racial intolerance? If you happen to get your news from the BBC News website, you might be under the false impression that the wave of terror in Israel has come to an end. The last mention of any of the still ongoing attacks came in an article published on October 24th and the last report on incidents appeared on October 22nd. The news that a third victim of the terror attack on a Jerusalem bus on October 13th succumbed to wounds sustained in that attack has not been reported by the BBC. However, those visiting the BBC News website on October 27th discovered that the corporation has not entirely lost interest in Israel related topics. Whilst ignoring yet another missile attack from the Gaza Strip and several stabbing attacks, editors did find it essential to inform audiences that “Walmart’s Israeli army Halloween costume sparks controversy“. The Israel Defense Forces (IDF) costume was also heavily criticised by many on Twitter. Walmart has not as yet reacted to the criticism. BBC audiences are not, however, told who “expressed outrage” over the Halloween costume or why, or what exactly “heavily criticized” entails. That apparently includes the Council on American-Islamic Relations. The American-Arab Anti-Discrimination Committee welcomed Walmart’s decision to discontinue the sale of the costumes. The story the BBC is reporting in this article is not about “controversy” over a Halloween costume but actually about yet another coordinated attempt to delegitimise Israel. By concealing that aspect of the story from its audiences, the BBC gives mainstreaming backwind to that delegitimisation. A photography exhibition currently on display in London was the subject of an article appearing in the BBC News website’s ‘culture’ section on October 7th. The same exhibition was also the topic of an item (available from 15:42 here) broadcast in the October 18th edition of BBC World Service radio’s ‘Newshour’. And indeed, tucked in between depictions of Victorian-era murder scenes, victims of Stalinist purges and the Holocaust and Joseph Mengele’s skull, is the following exchange (from 19:08) between Coomarasamy and the venue’s Head of Exhibitions Clare Grafik. Coomarasamy did not tell listeners is that the incident portrayed in this exhibit took place during the 51-day conflict between Israel and terrorist groups in the Gaza Strip in the summer of 2014 or that the Tannur neighbourhood is located in Rafah and that the August 1st 2014 counter-offensive there took place because Hamas had broken a ceasefire by kidnapping Lt Hadar Goldin. Neither did Coomarasamy clarify that of the 41 Gazans killed in that particular counter-offensive in Rafah, 12 have been identified as terrorists and 13 as civilians, with the rest categorized as undetermined, but “of fighting age”. Coomarasamy also refrained from informing audiences that Amnesty International’s campaign of ‘lawfare’ against Israel includes the use of this incident and he likewise made no effort to explain what the organization called ‘Forensic Architecture’ is and who is behind it or that it also partnered Amnesty International in the production of an app called ‘the Gaza Platform’ which reproduces and promotes one-sided and inaccurate information put out by two of AI’s lawfare partners – Al Mezan and the PCHR. So, whilst failing to make any effort to provide BBC audiences worldwide with either the context or insight into the political motivations behind the exhibit to which he gave amplification, Coomarasamy did propagate the notion that Israeli actions during a military campaign brought about by terrorist attacks on Israeli civilians should be lumped into the same “ultimate crime” category as criminal murders, political murders and genocide. 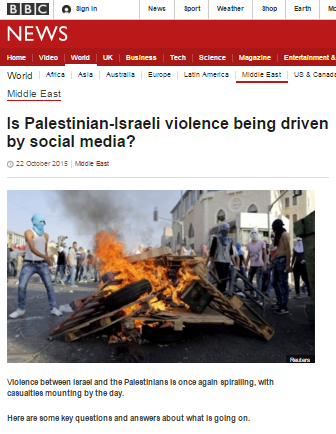 Those visiting the BBC News website’s Middle East page may have come across an article currently going under the title “Is Palestinian-Israeli violence being driven by social media?” which was actually first published on October 13th and has undergone numerous changes since then. “Violence between Israel and the Palestinians is once again spiralling, with casualties mounting by the day. The question posed in its headline is addressed in a relatively small section of the report (fewer than 200 words) which actually does little to inform readers of the scale and significance of the role of incitement spread via social media in fueling the current wave of terror, of the kind of content appearing on such platforms or of the use of social media by official Palestinian groups other than Hamas – including Mahmoud Abbas’ Fatah party. “While there is no clear evidence that the attacks have been centrally organised, some Palestinians have taken to social media to champion them. Posts praising and encouraging attacks on Israelis have emerged on YouTube and Facebook, while Twitter hashtags including “Jerusalem Intifada” or “Intifada of the Knives” are gaining traction among Palestinians. Israeli Prime Minister Benjamin has described the inflammatory use of social media as “Osama Bin Laden meets [Facebook founder] Mark Zuckerberg”. A staged online video in the name of Hamas, the militant group which dominates Gaza, which portrayed an Arab bystander stabbing two “Jews” for bullying Arab children and called for a new intifada, was removed from Hamas’ YouTube channel after Israel’s foreign ministry complained that it glorified violence. Many of the attacks and aftermath have been filmed on mobile phones and CCTV, getting quickly uploaded and shared. Israeli officials have expressed fear that images of assailants being shot could fuel anger and inspire further attacks. Notably, one of the terrorists who carried out that attack was lauded by Hamas on social media. The BBC’s account of “what is happening” of course does not include the use of the word terror. “There has been a wave of stabbings and some gun attacks on Israelis by Palestinians since early October, and one apparent revenge stabbing by an Israeli. The attacks, some of which have been fatal, have struck in Jerusalem, across Israel and in the occupied West Bank. Israel has tightened security and clashed with rioting Palestinians, leading to deaths on the Palestinian side. “Violence between the two communities has spiralled since clashes erupted at a flashpoint Jerusalem holy site in mid-September. No mention is made of the fact that the intention of the violent rioting on Temple Mount “in mid-September” was to prevent Jews from visiting during a holiday – as was similarly the case previously on Tisha B’Av and later at Succot. The article then goes on to mislead readers by stating that stabbing attacks against Israelis “began” on October 3rd when in fact sixteen such attacks had already taken place in the first eight months of 2015. “Soon afterwards, two Israelis travelling with their four children were shot dead by Palestinians in the West Bank. Two days later the stabbing attacks began. Both Israel and the Palestinian authorities have accused one another of doing nothing to protect each other’s communities. Israel says the Palestinian leadership is inciting attacks, and that the attackers are driven not by political frustration but by a radical religious ideology which opposes Israel’s very existence. As has been the case in all BBC coverage of this wave of terror, this backgrounder fails to tell readers in its own words that there is no basis to the conspiracy theories concerning a change in the status quo on Temple Mount and also neglects to inform them on the issue of Mahmoud Abbas’ incitement promoting that theme. “The war which followed Israel’s creation left generations of Palestinian refugees”. Naturally, no effort is made to explain exactly why “generations” of Palestinian refugees inherit that title even whilst living under PA or Hamas rule or why those in Arab countries have been deliberately kept in that status. As usual, Jewish refugees from Arab lands do not get a mention in this article. Readers are then told that the answer to the subheading’s question lies in “narratives” – with the BBC’s portrayal of the Palestinian narrative erasing the religious themes seen in the incitement fueling the current wave of terror from audience view and its paraphrasing of Israel’s position failing to inform readers of the legal basis for Israel’s existence. “Yes. Much more. The current violence stems from decades of unresolved conflict between Israel and the Palestinians. At its most basic, it is a fight over land and national rights. There are rival and seemingly incompatible historical narratives. The Palestinian position is that Israel was created on their land in 1948, turning many into refugees, and further occupied Palestinian territory, including East Jerusalem, in the 1967 Middle East war. They say any hoped-for future Palestinian state is being undermined by Israeli settlement-building in the occupied territories. The settlements are seen as illegal under international law, though Israel disputes this. Added to this is Israel’s expansion in East Jerusalem, where the proportion of Jewish Israeli inhabitants has swelled compared to the number of Palestinian residents, and where Palestinian districts suffer from poor infrastructure and services. Israel’s counter-position is that its right to exist is incontestable and that the Palestinian refugee problem is the result of wars forced on it by Arab neighbours. It says the Palestinian leadership – despite officially recognising Israel – have not proven they are willing to accept its permanence nor give up violence to achieve their aims. One paragraph in that account is particularly notable. Readers are told that “in East Jerusalem […] the proportion of Jewish Israeli inhabitants has swelled compared to the number of Palestinian residents”. Quite how the BBC compares a “proportion” of Jews to a “number” of Palestinians is unclear but notably, no mention is made of the fact that all Jews living in what the corporation defines as “East Jerusalem” – which as we know, includes the Jewish Quarter of the Old City – were forcibly displaced by the Jordanian invasion in 1948. Hence, if even one Jew went to live in “East Jerusalem” after the Six Day War, the proportion of Jews living there would have risen. But do the available statistics actually back up the BBC’s implication that there are more Jews than Palestinians in “East Jerusalem” either proportionally or in terms of actual numbers and that their proportion of the population in that area is ‘swelling’? According to the Jerusalem Institute for Israel Studies, in 2003 a total of 403,263 Jerusalemites lived in areas the BBC defines as “East Jerusalem” including 173,500 Jews (some in neighbourhoods which did not exist before 1967, some in those which existed before 1948 such as Neve Ya’akov and the Jewish Quarter) and 224,028 Muslim and Christian Arabs. In other words, in 2003 Jews made up 43.02% of those living in “East Jerusalem”. Ten years later, in 2013, the number of Jerusalemites living in the areas the BBC defines as “East Jerusalem” had risen to 509,440 and included 197,250 Jews (a rise of 23,750) and 305,470 Muslim and Christian Arabs (a rise of 81,442). In other words, Jews made up 38.7% of those living in “East Jerusalem” in 2013. So in fact, contrary to the BBC’s claim that “in East Jerusalem […] the proportion of Jewish Israeli inhabitants has swelled compared to the number of Palestinian residents”, the actual number of Arab residents in those parts of the city rose more than the number of Jews and the percentage of Jews making up the total population of “East Jerusalem” fell during the decade 2003 – 2013. Had the BBC confined itself to stating that the number of Jews living in what it terms “East Jerusalem” has risen since 1967, that claim would of course have been accurate – although sadly lacking in historic context. The claim as it stands, however, is inaccurate and misleading. This backgrounder falls short of meeting its declared aim of providing “answers about what is going on” because it adheres to the selective framing of the story adopted by the BBC from the beginning of its coverage of the current wave of terror. Any backgrounder genuinely seeking to provide information which would help audiences understand this topic could not ignore the issue of Palestinian Authority incitement and glorification of terrorism, would not obscure the religiously themed – and frequently racist – nature of that incitement and would not herd readers towards a view which obscures those uncomfortable issues by means of ‘contextualisation’ of the current wave of terrorism as “a fight over land and national rights”. An article intended to mould readers’ perception of the story and advance a wider political narrative would, however, do exactly that. The BBC’s reputation as a reliable source – underpinned by a supposedly unwavering commitment to cast-iron accuracy and impartiality in its reporting – means that members of the public, researchers and educators regard its content as being an authoritative record. The BBC itself relates to its online archive content as “historical record” and its Director of Editorial Policy and Standards has stated that “[h]owever long ago our online content was first published, if it’s still available, editorial complaints may legitimately be made regarding it”. Mr Jordan might therefore care to consider a report by the BBC Jerusalem Bureau’s Kevin Connolly (available from 00:43 here) which was broadcast in the October 24th edition of the BBC Radio 4 programme ‘From Our Own Correspondent”. Ostensibly providing listeners with a historical angle to the current wave of terror in Israel, Connolly’s report is remarkable for the fact that it once again promotes the notion that the attacks are of a “random and spontaneous nature”, ignoring the issue of incitement and the growing number of cases in which perpetrators have been shown to have links to terrorist organisations. 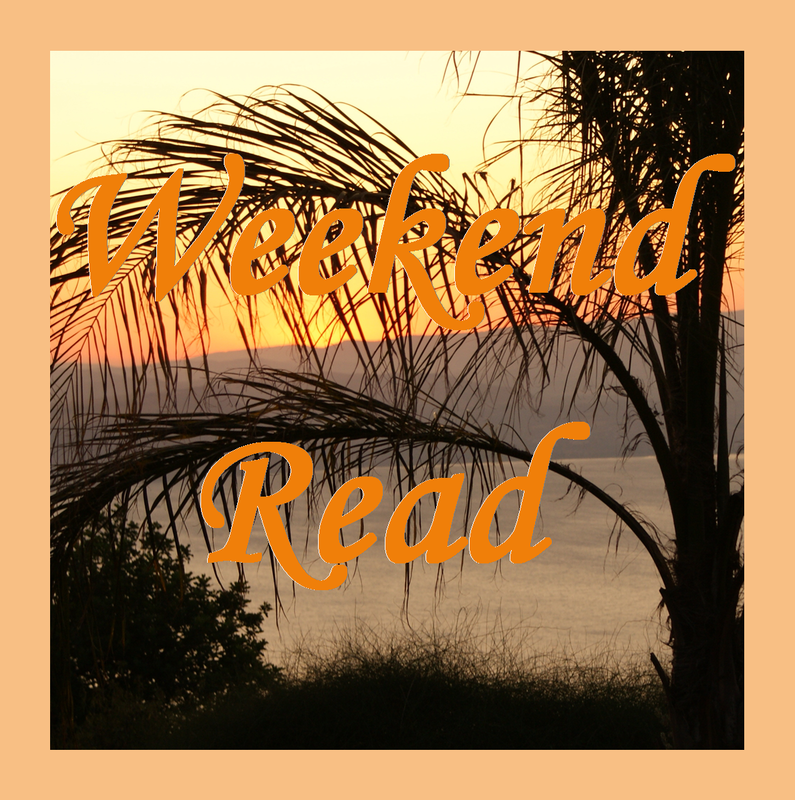 “….the sense that restrictions on movement are a form of collective punishment”. But Connolly’s politically motivated framing of the story reaches its zenith in his inaccurate portrayal of the history of Jerusalem. Mandate Palestine was not of course part of the British Empire, as Connolly implies in those two proximate statements. Britain indeed administered the Mandate for Palestine, but that mandate was established (along with several others) by the League of Nations with the specific aim of reconstituting a Jewish national home: a task which the administrator did not complete in the years before it returned that mandate to the League of Nations’ successor, the United Nations, on May 14th 1948. Having distorted one very relevant part of the history by erasing the Mandate for Palestine from audience view, Connolly then goes on to promote a blatant factual inaccuracy. The uninformed listener would obviously take that statement to mean that Jordanian control over parts of Jerusalem was both recognised and perfectly legitimate: the result of their having been handed over to it by the previous ‘landlord’. Despite having erased from the picture the fact that Jordanian occupation of parts of Jerusalem actually came about by means of a belligerent invasion of Israel by Jordan (together with four other Arab nations) immediately following Britain’s abandonment of its role as administrator of the League of Nations mandate and Israel’s declaration of independence, Connolly goes on to include a demilitarized zone (surely unexplainable according to his version of events) in his story. 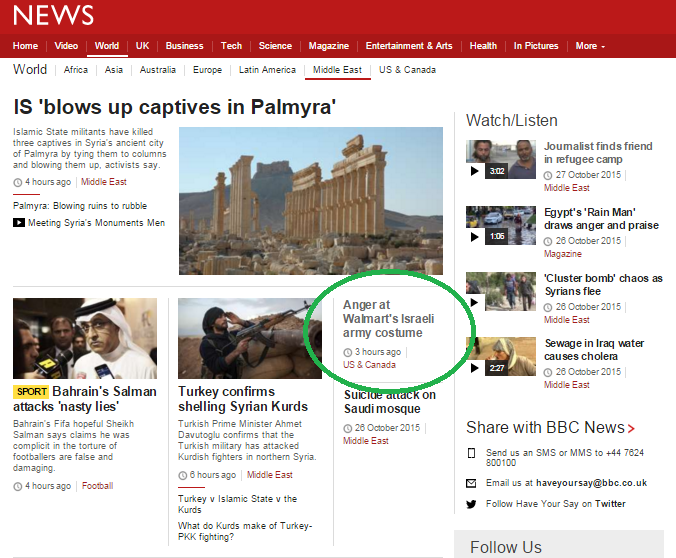 Here we have yet another example (previous recent ones can be seen here, here and here) of the BBC’s adoption and promotion of the inaccurate narrative whereby all of Temple Mount is al Aqsa and Connolly even portrays the site as exclusively “Islamic” – despite the fact that it is of significance to members of three religions. Of course those locations were in fact under Jordanian occupation and their later annexation by Jordan was not recognized by the international community, meaning that Connolly’s claim that they “belonged to Jordan” is inaccurate and misleading. The take-away message promoted to listeners to this report is that the roots of the current wave of violence are to be found in the Israeli occupation of areas that previously belonged to “the Arab kingdom of Jordan”. Not only is that an inaccurate portrayal but in order to frame the story in such a way, Connolly distorts and erases the history of the region in a manner which actively hinders audience understanding of the wider issue. Given that this report potentially risks wasting public resources by becoming the subject of editorial complaints, the BBC clearly needs to issue prompt corrections to the plethora of inaccuracies promoted by Kevin Connolly. An objective analysis will show that Yair Lapid is totally correct – Israeli guests on the show face a tough grilling whereas Palestinians and their supporters get basically a free pass. This is a genuinely harsh introduction – and considering that Sackur draws no distinction between the Israeli victims of terror attacks and Palestinian attackers killed by policemen, it maybe is too harsh. But let us compare this with the opening Hardtalk laid out for Saeb Erekat during an interview in February 2014. This is not the opening to a difficult interview in which Palestinian intransigence, rejectionism, incitement, corruption and human rights violations will truly be open for discussion. The question on the table is how best can the Palestinians isolate Israel: instead of asking hard-hitting questions, the BBC is merely asking whether the Palestinians can achieve their goals. The Hardtalk bias was open for all to see during last summer’s conflict between Israel and Hamas. Hardtalk conducted two interviews on consecutive days – the first interview, on July 24th, was with Danny Danon, a former Israeli government minister, and the second interview the next day was with Khaled Mashal, leader of Hamas. 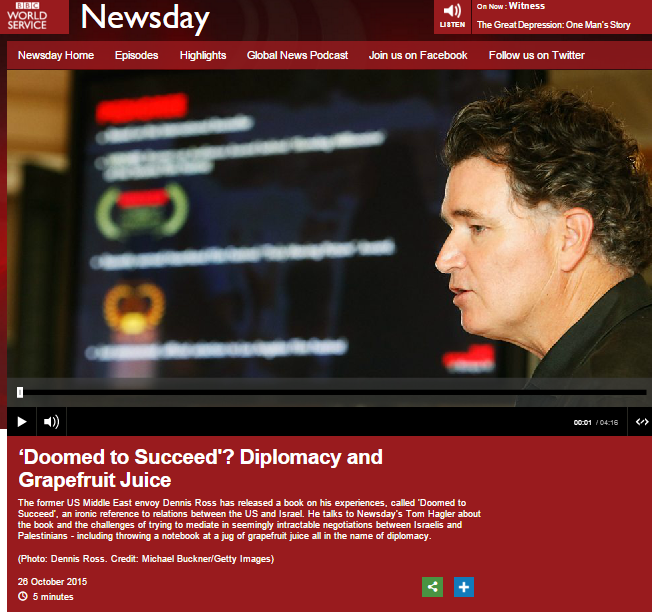 Compare this to the introduction to the interview the very next day, with Khaled Masha’al. Masha’al is not being asked any hard questions at all – no question about Hamas rockets, human shields, human rights abuses, or its openly jihadist constitution. Rather than hard questions, sympathy for Hamas simply oozes from the description of a “costly” conflict with Israel that may be a battle for Hamas’ very survival. This highlights a further point: not only does Hardtalk ask Israelis far tougher questions than Palestinians; the interviewers openly display sympathy for Palestinians and their supporters. So one man who actually got shot four times (for campaigning for what he sees as religious freedom) should have seen it coming because he received threats but another man who received threats (though admittedly, by “personal email,” no less) deserves our deepest sympathy. I mean, how bad are four bullets compared to an advertisement in a newspaper? Hardtalk is deeply biased. It challenges Israelis about how they defend themselves, but poses no hard questions to the inciters, jihadists, rocket launchers and terrorists. For Israelis, an appearance on the show is a hard talk. For Palestinians and their supporters, it is merely a soft chat.